Today, when you bite into a Wiener Works hotdog, you are enjoying the very same hotdog eating experience that was served up in 1973. 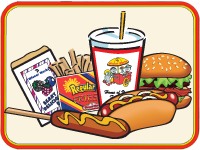 For over 30 years, the Fayetteville Wiener Works restaurants have been locally owned and operated by the same family. They caringly oversee all details of preparation to ensure you have a pleasurable experience every time you come to Wiener Works. Every employee of the company shares the philosophy of providing the best, fresh-made, hot food at the lowest possible prices. All Wiener Works sandwiches, whether hotdogs, hamburgers, fish, or BBQ, are always prepared to order with your choice of numerous mouth-watering toppings. There are now five convenient Wiener Works locations throughout Fayetteville; all with drive thru service and inside seating. Each store is open 7 days a week from approximately 10AM to 10PM. We are continually enhancing our menu and trying new products; however, there are few timeless favorites worth mentioning. Other than our signature Wiener Works hot dogs, we are very proud of our hot, savory shoestring fries. Year after year, the number one selling menu item, consumed at the rate of four tons per month, is still the footlong hotdog; topped with mustard, onions, and chili. Also popular is the footlong combo meal with drink and your choice of a side order of shoestring fries, real onion rings, or a French Fry Delight, starting at just $2.99 + tax. Other customer favorites include chili burger, Big Fish sandwich, and great shakes! We maintain a limited menu as we believe concentration on fewer items will provide the very best quality on a consistent basis.